Son Doong cave(Vietnamese: Hang Son Doong) is world's largest cave, located in Son Trach, Bo Trach District, Quang Binh province, Vietnam. It is found by a local man named Ho Khanh in 1991 and was recently discovered in 2009 by British cavers, led by Howard Limbert. 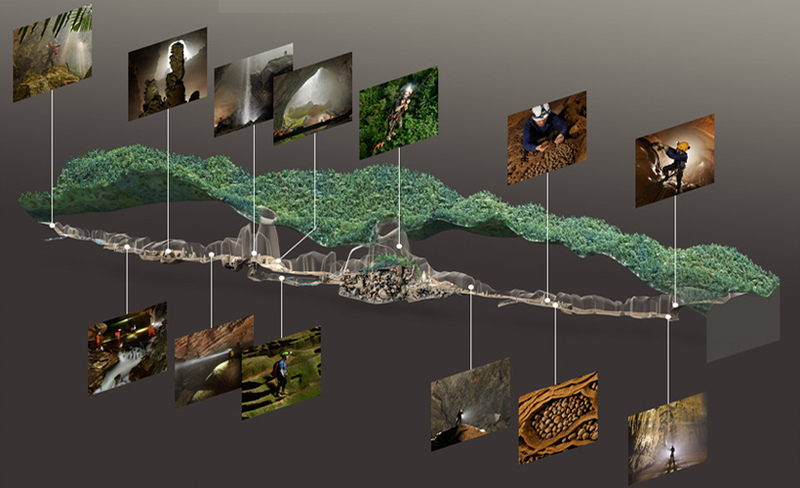 The name "Son Doong" cave means "mountain river cave", It was created 2-5 million years ago by river water eroding away the limestone underneath the mountain Where the limestone was weak, the ceiling collapsed creating huge skylights. Son Doong cave is more than 200 meters wide, 150 meters high, and approx 9 kilometers long, with caverns big enough to fit an entire city street inside them, twice as large as Deer Cave in Malaysia (currently considered the world's largest with 90 meters wide, 100 meters high and 2 kilometers long). Son Doong cave was classified as the largest cave in the world by BCRA (British Cave Research Association) and selected as one of the most beautiful in the globe by the BBC news. 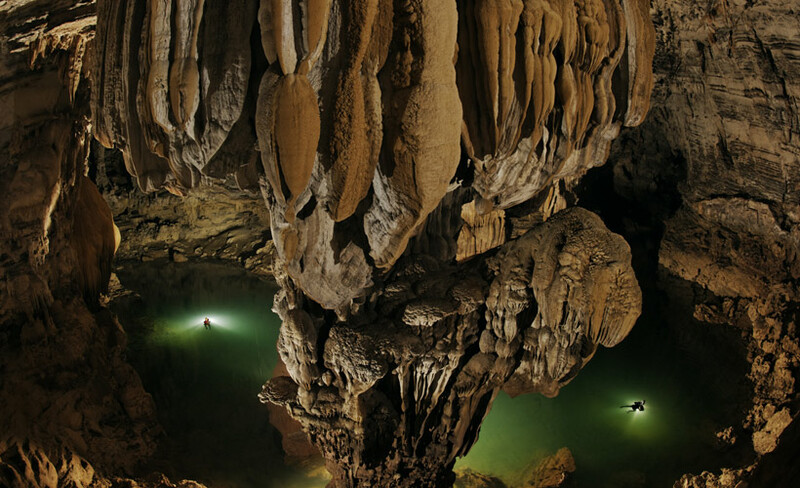 Son Doong cave is hidden in rugged Phong Nha-Ke Bang National Park in Quang Binh province near the border with Laos, the cave is part of a network of 150 or so caves, many still not surveyed, in the Annamite Mountains. It is very difficult to travers. 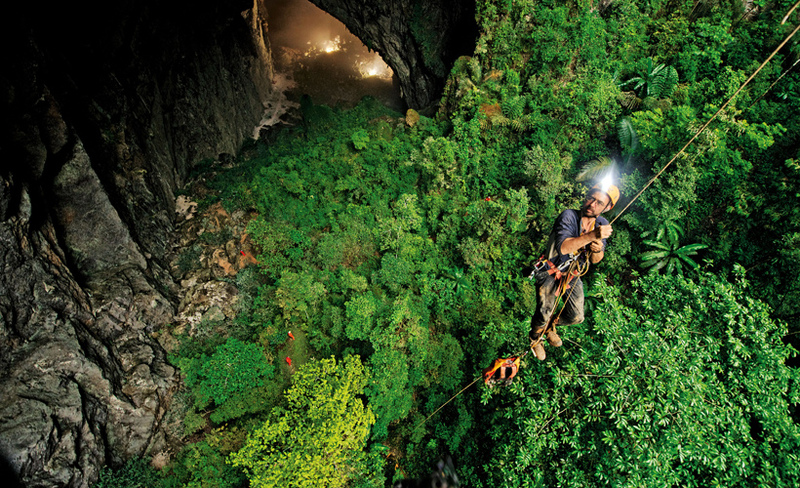 During the first expedition, the team explored two and a half miles of Son Doong cave before a 200-foot wall of muddy calcite stopped them. They named it the Great Wall of Vietnam. Above it they could make out an open space and traces of light, but they had no idea what lay on the other side. A year later, they have returned—seven hard-core British cavers, a few scientists, and a crew of porters - to climb the wall, if they can, measure the passage, and push on, if possible, all the way to the end of the cave... Click to view more cave exploring trips.